Soft, comfortable, easy-care knit dress with ruched band at the waist with contemporary neckline and fuller sleeve. As beautiful in the back as the front. Easy over the head fit. *Sizes: XXS 2, XS 4/6, S 8/10, M 12/14, L 16/18, XL 20/22, 2XL 24. Petite, regular and tall. I just received my Cambre Temple Dress. I absolutely LOVE it. It is true to size. I am 5’8 and got the TALL and its length is perfect. 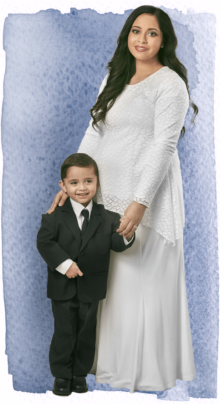 This dress is so beautiful and I cannot wait to wear it to the temple. It fits easily over the head and comes off just as easy. I couldn’t be happier with my purchase! I would recommend this dress to everyone I know. I am 6’3 and got the tall in size medium of this dress. It fits perfectly and is long enough for me! 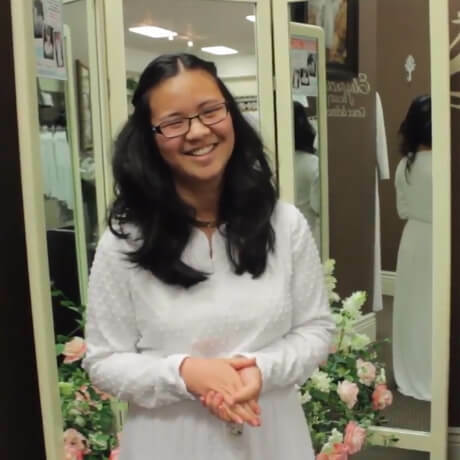 I feel so beautiful when I wear this and it is elegant and simple enough for the temple. High quality and does not wrinkle! Also easy to wash! Love this so dress so much! Beautiful dress, I also ordered it online based on the measurements in the sizing chart. Very true sizing. Love the dress, it is a pull over which I don’t know why I wasn’t expecting but very comfortable and love it. I got my Cambre dress yesterday. I ordered it online based of the measurements in the sizing chart and it fits GREAT!!!! I love the feel, the look, and the fit of this dress. It is my new favorite and I’m excited to wear it as often as possible! I just received my Cambre dress in the mail today. It’s beautiful, very soft and comfortable. The fabric is great for a warm day too. This is by far my favorite dress now. I love this dress. It is very heavy weight stretch knit. It is so comfortable and simply elegant. However, I followed the size chart on this and it is too big. I took the tag off before trying it on because so many people said it ran true to size, so I can’t return it. 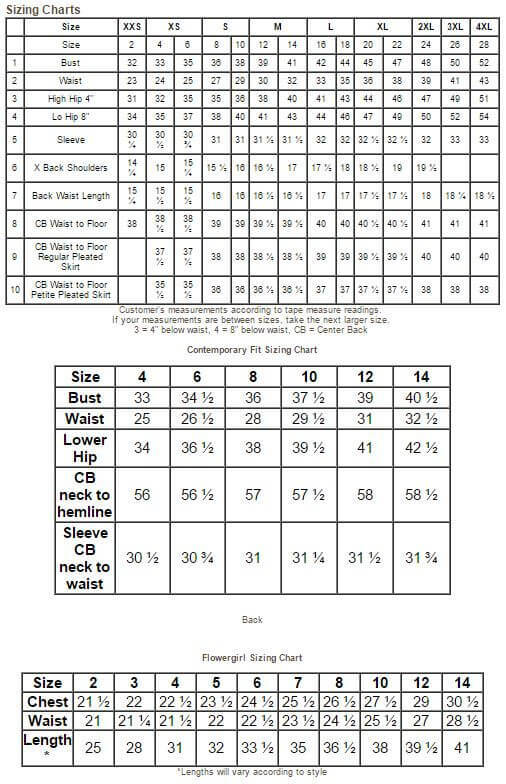 If you follow the size chart take two inches off your measurement and order that size. I LOVE this dress. The material is comfortable, there are no zippers to deal with and it bunches just right on top. I am 5’10” with long arms and this fits perfect. I’m so grateful for that. My sister and sister-in-law have since bought this dress. I would recommend it to everyone. I have rather narrow shoulders, and wider hips . . . this dress fits perfectly, because of the ragland sleeves. This is my fourth dress, and by far its Number One in my book. It is beautiful, doesn’t seem to wrinkle. It is well worth the investment. I wish you would carry more dresses with ragland sleeves, otherwise some of us end up with the upper sleeve seems drooping down onto the upper arm. I just got mine in the mail. I love it and the size is perfect as it shows on the size chart. It’s also very soft and comfortable! The dress is beautiful and I love that it comes in tall. It ran large so I had to go a size smaller. I tried on the larger one and got makeup on it, in spite being very careful so I had to buy 2. The stores need to have a silk scarf or something to put over your head while trying it on. Fortunately I gave the larger one to my daughter but I had not planned to do that. Even with the tall dress, the sleeves could be a little longer. Tall women have long arms. -No Zipper! I specifically ordered this one because there is no zipper, my last one from the distribution center- the zipper kept giving me problems. – Easy on and Easy off! Love it. Very soft. Very comfortable. Will need slip underneath as it is see-through, but a slip solves the problem completely. I am so glad that I ordered this dress! True to size. Love that it pulls over my head and I don’t have to mess with any zippers. Perfect length for me. 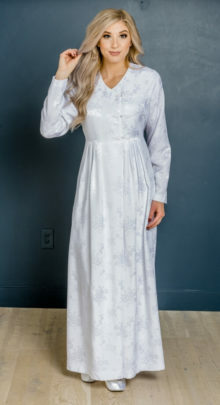 Favorite temple dress! Thank you White Elegance. I was looking at another dress on a different website that I liked, but this one was $50 cheaper! I love this dress. It was reasonably priced. It fit extremely well, and is very comfortable. Had to return for a smaller size. I really wanted to love this dress. I love the style and fabric, but the fit was awkward for me. It fit through the body, but the rest felt like a petite size in arms and length. I am 5’7″ and bought a small. It was too short and the sleeves were short, yet too baggy in the biceps area. I thought about trying a small tall, but I don’t think the baggy arms would be any better. Thank you for the timely exchange! I find the Cambre to be so comfortable and nice looking on. Not easy when you are plus size. 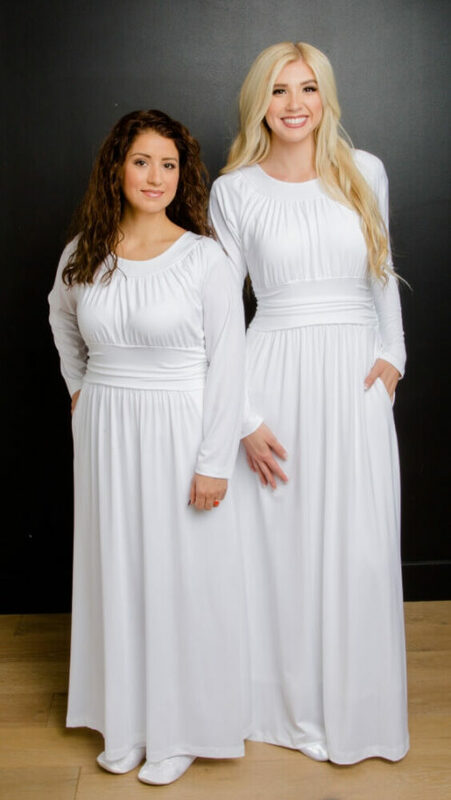 Most dresses have straight unforgiving tight arms and plus size women are forced into the “house-robe” style. Thank you for a lovely alternative. The fabric has a beautiful drape and weight. Not too thin, not too heavy. I love this dress. I’m an ordinance worker and needed another white dress. It’s comfortable, and soft, perfect length and never wrinkles.